What is Arca-Swiss Quick Release System? Home » Photography Tutorials » What is Arca-Swiss Quick Release System? Many of our readers frequently ask us questions about tripod heads and accessories to support heavy camera and lens combinations. Those that are especially new to super telephoto lenses quickly discover that tripod feet supplied by all manufacturers on modern lenses are simply not suitable to be mounted on regular tripod heads. Unfortunately, whether it is Nikon, Canon, Sony or a third party lens manufacturer like Sigma, they all supply non-standard tripod feet with their lenses. For new lens owners it can be a rather frustrating experience trying to figure out which tripod head would fit their large and heavy lenses, because nobody wants a lens worth thousands of dollars to end up crashing on the ground. And since most tripod plates are only equipped with a single mounting point, it can be extremely unstable and even potentially dangerous to mount anything heavier than a few pounds on them. The solution, which has become somewhat of a standard nowadays, was developed by a company called Arca-Swiss back in 1990s and since then has been popularized as “Arca-Swiss Quick Release System”. The idea behind this quick release system is quite simple, but very effective. Almost all professional photographers that use super telephoto lenses have adopted the Arca-Swiss quick release system and more photographers are converting even their regular cameras to this format for ease of use, stability and compatibility reasons. The Arca-Swiss quick release system is based on a two piece mechanism. The first piece, generally referred to as a “plate”, is attached to a camera or a lens (or any other device). It comes in a standard, “arca-style” 35mm wide form with a 45° dovetail and can vary in length (a sample plate is illustrated above to the right of the tripod head). The second piece is the mounting base, generally referred to as a “clamp”, where the plate gets attached and secured. The clamp can be fully opened, allowing the plate to be dropped in and secured, or can be partially opened to allow the plate to be slid into the position. The biggest advantage of the Arca-Swiss quick release system is this ability to slide the plate without having to worry about mounting or dismounting anything. The 45° dovetail on the plate, as pictured below, allows equipment to be moved across the clamp and secured in a specific location using a side knob or a locking release. L-brackets allow for maximum flexibility for mounting cameras, while still allowing access to side panels. Once a heavy super telephoto lens is balanced and secured on the clamp through its arca-style foot, both vertical and horizontal movements are possible without the need to constantly fiddle with various adjustments and knobs. While tripod ballheads have the tendency to quickly drop the setup towards the heavy side even at a slight angle, the Gimbal head system does not do that (provided that it is balanced). Panning clamps are great for general photography, as well as specialized needs like panoramic photography. 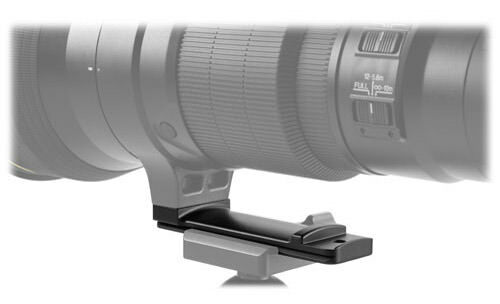 With a panning clamp like above, you can buy a nodal slide for creating single row panoramas, or you can get a complex and expensive multi-row panorama setup with multiple panning clamps for both vertical and horizontal motion. See my article on how to create panoramas for more details about panoramic photography. Thanks to the versatility of the Arca-Swiss quick release system, it can be effectively used for pretty much any photography needs – from panoramic and 3D photography, to complex macro setups. Since the plates can move up and down the clamps, opportunities for different setups are practically limitless. As a result, there are many different products and solutions on the market for all kinds of camera gear. And the best part is that you can mix and match different products without having to worry about compatibility issues, because the standard for the plate is mostly the same. Personally, I use a complex custom setup that involves 6 to 8 different components from different manufacturers for testing lenses (more on this on a separate post). It allows me to move my camera side to side and front to back for fine tuning and focus bracketing, which saves me a lot of time and frustration, especially when dealing with de-centered lenses. I have been using their ball head and arca-swiss system for three years with no complaints. Thanks John, I’ve added Sunwayphoto to the list! I purchase the KIRK L-Bracket ( for Nikon D700 or D300 ) BL-D300G . It does fit on a Arca swiss plate half way into grove but it does not fit snug into the recess of the grove. When I try an true an original Arca plate it fits perfect and snug. Nasim may or may not be available so I’ll make some comments in the meanwhile. You don’t say what kind of clamp you use but I suspect from what you are saying that it is an Arca-Swiss (brand) lever clamp. From what I can make out there are two main divisions in Arca-Swiss clamps/ plates in common use. Arca-Swiss, Chinese manufacturers (such as SunwayFoto) and I think Acratech follow the original Arca-Swiss standard. RRS, Kirk, Markins and HejnarPhoto follow a different standard and there may be some differences there from one to the other. Between these standards the angle of the bevel may be different and the width may differ. A screw clamp may be less convenient but will probably fit everything. An RRS lever clamp has no adjustment and will only fit RRS or other identical clamps and rails (probably Hejnar Photo, maybe not Kirk or Markins). An Arca-Swiss brand style lever clamp (and probably most others) has a small adjustment screw that you can use to adjust for different plate widths. However, this is fiddly to adjust and not so good if you have different plate sizes. Also, there is a design weakness and that adjustment screw can degenerate over time, even the Arca Swiss brand ones and potentially cause the plate to collapse and your camera to fall to the ground. (I have read of that happening with an Arca Swiss brand one and it happened to me with a Sunwayfoto one when they followed that design though my camera did not fall). In my opinion, if you want to use lever-action clamps and do not want to go the proprietory RRS route, the best option is probably the clamps that have a lever on one side and a screw on the other such as Sunwayfoto or Acratech. Whatever you do, it is always a good idea to check your camera when you mount it on a clamp to ensure it is tightly affixed. Darrell, Murray is absolutely correct. If you are indeed using proprietary Arca-Swiss you will need to use there plates only. When I first ordered my two RRS ball heads I ordered them with lever release clamps because I thought they would be better for me to use but I had all Kirk L-plates. I like the way Kirk makes their L-plates more than RRS. I had to contact RRS and request switching out the lever clamps for screw type and they were very gracious in allowing me to do this. Of course they tried to sell me their L-plates but I wasn’t ready to switch since I had plates for gripped and non gripped cameras. Sometimes purchasing a particular branded line requires a bit more research to see if existing equipment will work. As Murray states if you try switching to screw clamps you may find the Kirk plats to be more compatible. I wish to second your recommendation for Sunwayfoto products, which have initially impressed me with the high quality and superb finishing of their XB series ballheads (I own both a XB-44 and a XB-52, the latter being a perfect match for my Gitzo Systematic Series 3 tripod). I’ve subsequently acquired a complete focusing rail rig that can be easily customized for panoramas or macro photography, which includes a comprehensive set of nodal slides/rails, vertical rails, double clamps, panning clamps. I was once again most favorably surprised by the quality of these accessories, which perform at the highest level but at a fraction of the cost of similar offerings available from other well known brands. The people at Sunwayfoto are also responsive to any requests for assistance and vary capable to guide the customers towards the solution that best fit their specific requirements! So I would say that they are top notch also in this very fundamental aspect. On a side note, I just wish to point out their correct registered brand is “Sunwayfoto” (and not Sunwayphoto). I have to admit, Sunwayfoto has been nothing but nice when I have dealt with them. I ordered very early on in their process and had to order directly from the factory in China. One day, out of the blue, I received an e-mail suggesting I use a leveling joint. I agreed, and they sent me the prototype, at that time it was called a DYH-66, with the leveling bubble on the outside lip. This allowed me to set my tripod anywhere (even unleveled…though that of course is not safe!) and always have my ball head completely level, while using the bubble on the clamp set my camera perfectly level …. I was then able to rotate the ball head (DB52LR) base without ever having to worry that my horizon was going to be askew when rotating. Quick panos were easy and sharp without having to order the entire Pano-1 kit. I would have ordered the Pano-1 had I made it a habit of shooting panos on a regular basis, but with the DYH-66 I have never had a single alignment error anyway. I understand they have since released a set of leveling bases. I also use their custom fit L-plate for the D800, that has a nice curvature fit to the front of the camera. Totally rock solid stuff. Darrell, this is the reason I use the Kirk L-Plates and stay away from the RRS units. I do have several RRS Ball heads but never purchase the lever release clamp from them. The lever release clamp although very convenient to use work best with RRS L-Plates and not with other types. The screw type clamp does indeed work with either Kirk or RRS L-Plates. The RRS L-Plates seem to be proprietary to their equipment. Darrell, sorry for the delay in responding. I’m retired US Army and participated in several Memorial Day Celebrations this weekend. Murray also commented. I think is shows you were after one of the best ball heads on the market but I’m thinking if you read what Murry says you may have your answer. Some proprietary manufactures only want you to use their equipment and I’m thinking from what you write here Arca-Swiss may be one o them. Perhaps that is why Sunway Photo is compatible with many of the Arca-Swiss equipment. I stated before that when I first purchased my L-plates they were all Kirk. I like the way they are made better than RRS. I have several Kirk ball heads and then purchase two RRS ball heads with lever quick release clamps. The Kirk L-plate did not fit well with the RRS Lever clamps but RRS was very gracious to allow me to return the Lever clamps and provided the screw clamps for the B-40 and B-50 ball heads. The screw clamps, may be a little more involved to use and not as fast but the Kirk L-plates fit well and snuggly. You may be looking at replacing the lever clamps with screw clamps or replacing the L-plates for one that fit better into the Arca-Swiss line. Gerald, using the Sirui line here among other professional photographers gets you laughed at. However, some of my friends have had failures at the worst possible times. Last year on a trip to northern Montana to photograph wildlife for the US Department of the Interior, one of the other hired photographers using Gitzo tripod had a catastrophic failure of the leg crown and lost the front element of his 600mm Nikkor. I loaned him my other Sirui tripod that I brought along and he never looked back. This guy has been using Sirui ever since. I’m a Nikon shooter but I don’t hesitate to purchase quality 3rd party lenses. I’ve found over the years that not every big named brand is the best even with reputation behind it. Some products take time to get noticed and I think Sirui is one of these. P324 Monopod w/RRS MHO2 Pro Best monopod head made. Thanks Gerald, added Sirui to the list! I use Sirui L-Bracket on Nikon D800e using the RRS BH-55 ballhead it fits well very snug no movement at all. That is using the Release Lever Clamp. Though there are no compatibility issues with screw clamps such as those illustrated, it’s a bit trickier with the more convenient lever clamps because some manufacturers have deviated from the original Arca-Swiss specification. Most American manufacturers follow what I think of as an RRS standard (except I think Acratech); most of the Chinese follow the original Arca-Swiss standard. The lever clamps for most manufacturers (apart from RRS) have a small adjustment screw so you can adjust the width. This rapidly becomes a nuisance where you have rails and plates from different manufacturers and can even disintegrate with potential danger to your equipment. I have taken to using SunwayFoto clamps that have a lever on one side and a screw on the other. (In other words, a large screw as shown above, not a small adjustment screw). This gives you the convenience of a lever and you can quickly adjust for different rails and plates. fully agree with your comments! Deviations of manufacturers from the pure Arca-Swiss standard are too often disregarded by end users, which may impact considerably on how the various equipment integrate together with potential serious implications that could even result in severe damages! As you noticed, RRS seems to be one of those manufacturers who firmly decided to depart from the original Arca-Swiss standard, a decision that is probably related more to internal/marketing considerations but that – in essence – put a serious limit to the ability of the users to effectively mix and match different pieces of equipment together! As an owner of many Sunwayfoto products I can testify, as you already did, that their Arca-Swiss clamps are absolutely compliant with the original design while also offering a series of specific quick release clamps that provide the convenience of an additional screw that complement the lever mechanism on the opposite side, so as to be able to easily and securely adjust their width for compatibility with plates/rails from different manufacturers. 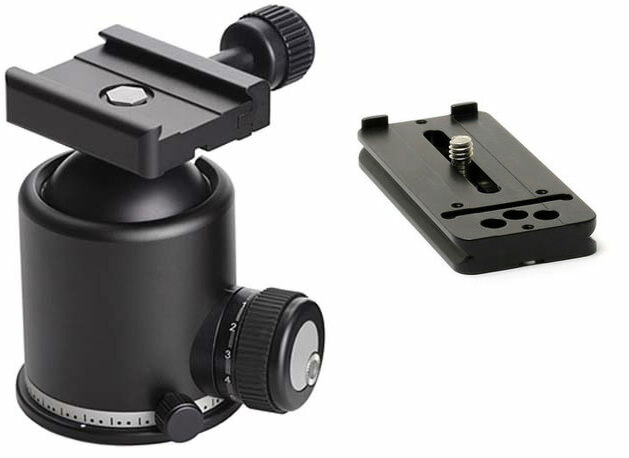 I own a Sunwayfoto XB-52DL ballhead that comes with a Screw/Lever Combo Clamp (DLC-60). The construction, finish and overall quality of the XB-52 are absolutely excellent and the DLC-60 clamp provide the desired flexibility and security for use with a wide range of equipment and accessories! Since I started to use the Sunwayfoto products I never had to look around for anything else to fit my needs. Fully recommended! Thanks for the comment, Marco. Before getting my first DSLR (which was a Nikon D3) I stayed with film because digital was too much of a moving target. My main camera in those last few years was a Gaoersi 6×17, a perfectly functional well-machined Chinese large format panorama camera. The Chinese may not be so good at software or making lenses but they can be just as good at metal machining technology as developed countries, at much lower prices. For years after college I used Bogen/Manfrotto tripods with their dedicated camera plates. Only several years ago did I discover Arca-Swiss style plates and attachments. I use Kirk personally and love everything they make. I then discovered L-plates and use them on all my cameras. I have them for gripped and non gripped cameras. 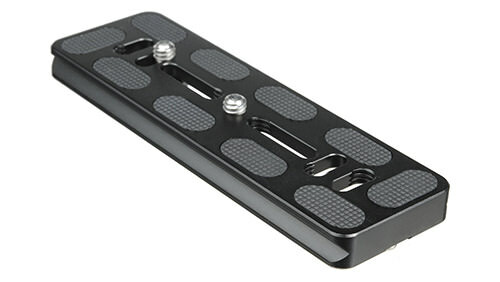 I believe Manfrotto just came out with a new quick release plate in Arca-Swiss style in order to keep up with the times. Several years ago I also started switching to Sirui tripods and some of their ball heads because they were all Arca style, reasonably priced and excellent pieces of equipment. I take plenty of heat from fellow photographers here at home for not using either Gitzo or RRS but I’ve never had a failure with the Sirui Line. I now have six Sirui tripods and am about to switch my studio tripod from Manfrotto to Sirui. Personally, I do not use quick release levers on any of my ball heads or gimbals. I’m old school and prefer screw knobs; but that’s just me. For my professional work I don’t need the speed the lever release offers and I feel more comfortable with the screw type releases. I also like Markins in Canada. Great product! Thanks Steve! Forgot to add Markins to the list – they are definitely very popular. People are grumbling about the price of a MB-D series battery grip and here is a piece of machined metal selling at almost the price of a camera! Call me naive, but there is no reason this should be that expensive. But, your other article on the Hejnar seems like a good value for the money. I might end up getting a few items from them. I find great flexibility using the ARCA system. All of mine are RRS with mounts for multiple bodies of different manufacture. Mostly used for indoor/ outdoor close up work and travel photography. One plus is being able to share a single tripod with my wife when we travel. I agree with Steve S. Markins is another fine product and their customer service is second to none! I recently bought a MeFoto tripod for travel and short outings. It comes with its ballhead and Arca-Swiss Quick Release system. Very portable and convenient system. Just to support Steve S, and Glenn, I too have the Markins Q20 and one of their plates. They are excellent products, and customer service is very responsive. I have an important comment about the Arca-Suisse compatibility, in particular, when the Monoball is equipped with the Flip-lock release plate. Indeed, this setup works with plates from different manufacturers because the release plate can be fine adjusted with a screw. But mixing the plates does not work. For example, a Wimberley lens foot and a Novoflex L-bracket have slightly different lateral dimensions. In order to avoid the fine adjustement, I had to exchange the L-bracket against Wimberly quick release plates for the camera. Therefore, the standard clamp (as shown in your image) might be better for the use with plate systems from different manufacturers. That is a strong reason to choose the company you deal with carefully and stick with their system. Mix and match on a machined item (system) that has only a name and not an international standard will always result in errors. For myself, I stuck with Sunwayfoto for all foot attachments and L-plates even though their flip release plates has a fine tune adjustment. I’m from the UK & do quite a lot of Hide photography for wildlife. Ideally I like to use two cameras, one with say a 500 lens, & one with say a 70-200 or perhaps a 300 lens. Any ideas how I can mount both of these on one tripod? I use a Manfrotto tripod with 501 plates. David, you will have to do a custom rail rig to achieve that. Buy a good tripod head that can handle all that load, then get a long enough Arca-Swiss rail that can fit both cameras. Then you need two conversion clamps that will mount your lenses. Should be pretty simple to do! Benro actually makes such a rig but I don’t know what the load rate is for two camera set up with that size equipment. I wrote an entry in DPreview five years ago www.dpreview.com/forum…ad/2509908 foreseeing the move to Arca-Swiss and asking why did not all (long) lens manufacturers include an A/S-compatible foot, since it could also be backwards compatible to the ubiquitous 1/4-20 thread. A heated discussion ensued and another famous blogger intervened to defend my position. I am more than happy now to see that even Manfrotto and Gitzo are beginning to sell A/C-compatible gear and nobody laughs at this idea any more. There is a full list of Arca-Swiss compatible brands in the thread I mention, if I remember well. It is much bigger than yours. Some Arca-Swiss compatible items are as pricy as fine Swiss watches. Which is why I didn’t buy into it. Sure the quality looks beautiful but boy that beauty comes at a steep price. I have the Arca-Swiss system (Monoball Z1) and would like to attach a 300 mm 2.8 to it. Which plate should I use? I have an Arca-Swiss Classic Plate for my D700 and was wondering if I could use the same for the lens. Donna, I use a variety of the ProMedia Gear’s products. I’m not aware if they make ball heads but all their camera plates and lens plates are compatible with Arca-Swiss gear. I use the Boomerang Flash brackets for gripped and non gripped cameras and I have the Tomahawk Gimbal. I also have several long lens plates that are very good. They do make quality gear and the customer service is friendly and helpful. Donna, I use ProMediaGear plates – they are excellent and are fully compatible. Actually, I met both owners (brothers) at the NYC Photo Plus event. They were really cool guys and seemed to be doing a great job with creating products and running the company. I would certainly trust their tools, very high quality. What about adding MeFoto to the list? All of their tripods are Arca-Swiss compatible and they even have a phone holder (SideKick) with integrated ballhead for Arca-Swiss. Thank you for your suggestion – I added MeFoto to the list. The Sunwayfoto plates should be avoided I bought two one for the Canon 7D and one for the Canon 6D neither fitted the Arca-Swiss Z1 they were too small and didnt lock. Buy Arc-Swiss much safer. 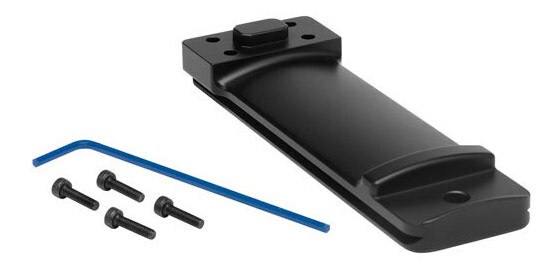 anyone know: can the arca swiss dovetail system mount directly on the arca swiss rail — without a bracket, since IT IS a dovetail rail. I have read your article with much interest as heard a lot about Swiss Arcas. I am still confused as tripod/monopods come with their own head that can be screwed into the camera/lens. My Manfrotto equipment come with heads that all have a detachable plate that is screwed into a lens or camera. So what is the benefit or difference in having a Swiss Arcas plate? I can understand if you have a very long/heavy lens such a 500mm or longer and use a Gimble type head but if you are talking about a 300mm that you are using a pod for steadying purposes, then please can you clarify for me. Would I then need to buy a new head for my tripod/monopod as well? Am preety new in photography. I have a D90. I need to know. If am going to use a RRS L plate what tripod head do i need ? Anyone have a solution for a L bracket to fit Nikon D7200 with MB-D15 grip using the RRS BH-55 ballhead with the Quick Release Lever. 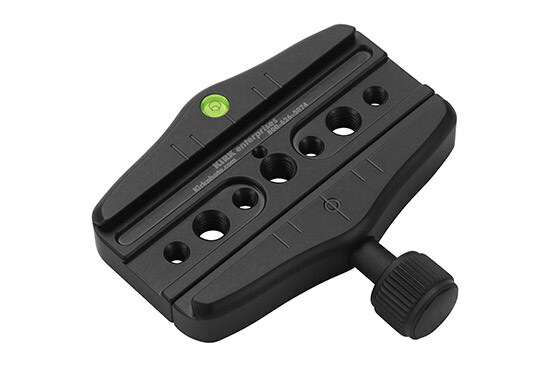 All I can see on RRS website is the plate only (BMBD15: Plate for MB-D15 grip) L bracket is not made for the Nikon grip. I do use RRS L-Plate (for Pentax DSLR camera) together with Arca Swiss Monoball Z-1 equipped with QR clamp (I believe there were also screw-clamp versions sold). RRS plate fix in Arca Swiss clamp is rock solid, but somehow slow, as the small range of QR lever allows only to slide the L-plate into the clamps from the side, but not to put the plate from the top of the clamp and then to fix (like do most of the regular QR systems, Manfrotto/Gitzo including). I also have Gitzo 2xxx-series rectangular plates, which I found too fiddling with long lenses (esp. when put aside to vertical shooting) used with Gitzo 2xxx-series ballhead so I went into L-bracket and Arca Swiss route, and I also have Manfrotto hexagonal plates designed for medium format which robust are and rock solid with corresponding Manfrotto hexagonal clamps (I have no idea if Manfrotto make them any longer? ), but somewhere cumbersome with APSC body due to plate size. The legs are Gitzo 2xxx series. I find RRS L-Bracket very helpful to keep camera body both in horizontal and vertical (esp. when camera prism is to the right side) shooting, I do not use battery grips as I prefer L-bracket over them. I looked long and hard at the RRS BH-55 + PCPro but I bought the Surui K-40X and PCPro instead. The reviews of the K-40X do not do justice to the heft and quality feel of this ball head. However… both BH-55 and K-40X are very hefty grenades. They are quite large, heavy and ooze luxuriousness. I admit being quite surprised at the high quality of the Surui made-in-China product. At first, I wanted to use the ball head for double-duty on a monopod. Big mistake. Too big, too heavy, too clumsy. I bought the Surui L-10 instead, and fitted it with an RRS B2-mAS mini clamp for camera bracket orientation. I certainly like the RRS stuff, but find it vastly expensive. My RRS panorama components are superbly made, and priced as such. I own the PC-PRO panning base, and find it every bit as thick and sticky as the Surui panning base. That said, Buy Once and Cry Once. Caveat: Buy Right the first time, or cry repeatedly as you swap equipment. Carefully examine all your needs and buy components that interchange. RRS products are Tinker Toys or Erector Sets for Big Boys. The BH-55 + PCPro is the right idea for panorama work. My solution was the K40-X and PCPro panning clamp. 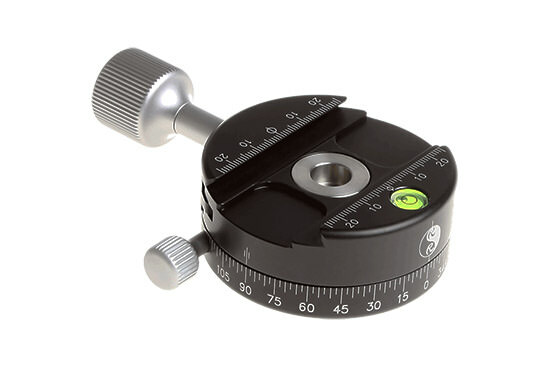 The ball levels the panning clamp, which is fast and easy. Panning from the ball head panning base is an exercise in frustration because you have to level the tripod. Many thanks to Nasim for his in-depth coverage. I came across your ‘What is Arca-Swiss…’ feature whilst looking for information on macro focussing rails, and spotted a typo. You indicate that Arca-Swiss plates are 35mm wide when they are actually 38mm. I have an assortment of ‘Arca-Swiss’ items.Mostly RRS but also some of Chinese and European origin. All measure 38mm within a tenth or two of a millimetre. You probably realise that, despite the name, Arca-Swiss is actually a French company. They have many other interesting products (with equally interesting prices!!!!) but many of these are not what we would call Arca-Swiss compatible. In fact they have several sizes and shapes of rails etc, depending on the nature of the product. Thank you Nasim for the useful article. 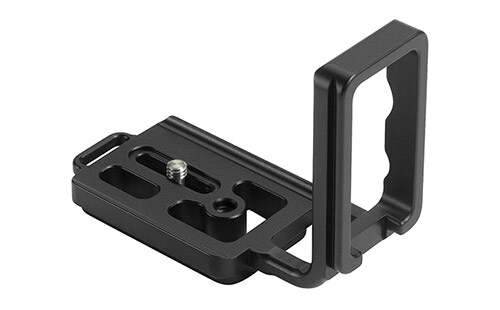 I was wondering if any of these L-bracket could be used in a fluid video head quick release plate of manfrotto video tripod for portrait orientation shots? Hi everyone, well I bought the Arca-Swiss Monoball X-Table System (802330). It took me a while to figure out how to mount this to a tripod without the monoball manufactured by Arca-Swiss. 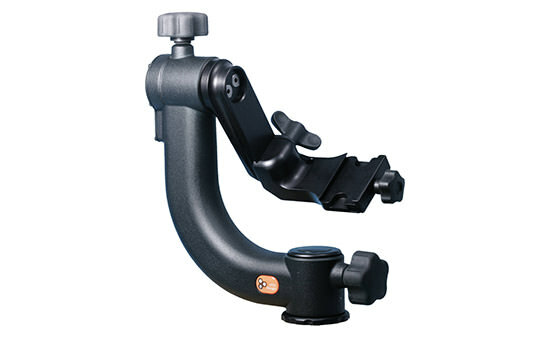 I found a Kirk QRC-3.18 Arca-Type Quick Release Clamp that looks like it will work to secure the X-Table to my tripod. Are there any L-Brackets that are not Arca-Swiss compatible? I have two tripods, but different plates, neither Arca. My hope is to find something that lets me screw the plate into the bracket. Not ideal, but cheaper than replacing. There is not a single Arca-Swiss standard. Most American ones diverge from the original Arca-Swiss standard and most Chinese ones conform to it. My solution is to use clamps that have both bayonet and screw modes so anything will fit but you still have the convenience of bayonet. Acratech and Sunwayfoto make them for example. Have lens SIGMA 105mm with Arca -swiss tripod collar TS-111 and a Manfrotto 190 Go tripod with MH804-3W head. Which platform -clamp is suitable? My guess is that it will be the original Arca-Swiss standard but I don’t know. You could always ask Sigma. If it is, RRS bayonet clamps will not work because they’re not adjustable. Any screw clamp should be OK or a combined screw/ bayonet clamp such as from Acratech.